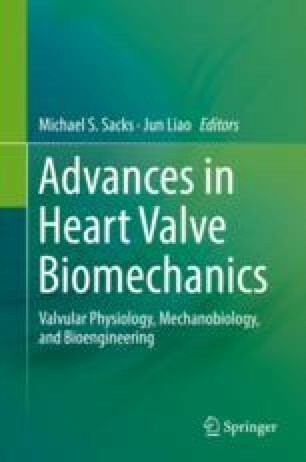 Tissue engineered heart valves are being developed in order to provide an alternative prosthetic valve to patients suffering from valvular heart disease. They aim to address the limitations of currently existing bioprosthetic and mechanical heart valves, which have a limited functional life or require lifelong anticoagulation, respectively. Tissue engineered valves generally consist of three parts: a biodegradable polymeric scaffold for initial structural integrity and cell attachment sites, entrapped or seeded cells that remodel that biodegradable scaffold, and stimulation paradigms to direct cellular activity (especially production of a functional extracellular matrix). In vitro functional testing is useful to assess valve designs based on their hydrodynamic performance under physiologic pressure and flow conditions. However, in vivo testing is crucial since tissue engineered heart valves aim to provide a living valve capable of cell-mediated repair, remodeling, and growth. The aforementioned considerations comprise the focus of this chapter. Minnesota Department of Health. Diseases and conditions identified in children. [Webpage] 2015. Available from: http://www.health.state.mn.us/divs/cfh/topic/diseasesconds/. Cited 24 Aug 2015. Centers for Disease Control and Prevention. Data & statistics for congenital defects in the US. 2015. Available from: http://www.cdc.gov/ncbddd/birthdefects/data.html. Cited 24 Aug 2015.